Canape is always a mysterious decorative tiny snack. Canape can be prepared with a piece of bread or puff or a cracker topped with any flavours for a single bite. I had some salt biscuits left in my cookie jar so I thought I could make something with it. I recollected a note I read about canapé. So I thought I could give it a shot! Here is it, Salt Biscuit Canape. 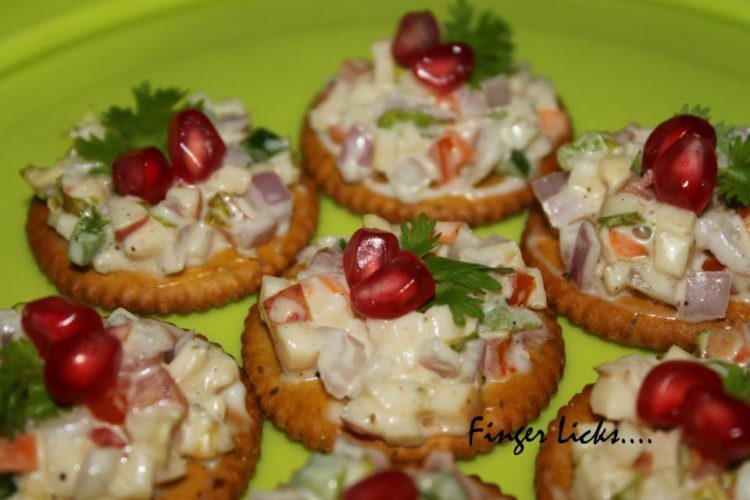 Its a canapé made with the salt cracker with the very amusing topping of thinly sliced mixed vegetables and fruits and nuts on the creamy base of mayonnaise.it is easy to make and hope you will enjoy it! Mix all the vegetables and fruits with nuts, olive oil, salt, pepper and mayonnaise. Arrange the biscuit over the serving plate. Place some mayonnaise on the biscuit. Take a spoonful of mixed vegetable and fruits and put it on the top of the mayonnaise. Decorate it with coriander leaf and pomegranate seeds. The easy salt biscuit canape is ready.